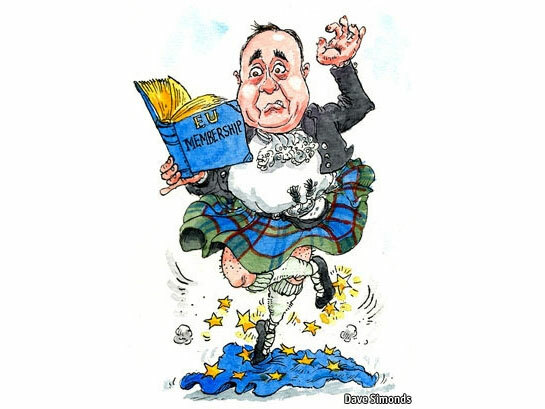 FOR months, years even, Alex Salmond, Scotland’s first minister and leader of the Scottish National Party (SNP) had given assurances that if and when Scotland broke away from the rest of the United Kingdom it would still remain part of the European Union. Without such a guarantee he knew he would be unlikely ever to win sufficient backing to realise his dream of a sovereign country north of the English border. Asked in a BBC interview last March whether his government had sought its law officers’ advice on this vital issue, he replied, seemingly unequivocally: “We have, yes.” Now it appears that no such advice had ever been sought and, indeed, that there is nothing automatic or clear about an independent Scotland’s future relationship with the EU. Though most constitutional lawyers agree that Scotland would have to apply afresh to join any international organisation—be it NATO, the UN or the EU—many believe that its candidacy would be fast-tracked by the European Commission, with a heavily EU-dependent Spain ultimately unlikely to oppose it.